Johns Hopkins University engineers are using diamonds to change the properties of an alloy used in phase-change memory, a change that could lead to the development higher capacity storage systems that retain data more quickly and last longer than current media. The process, explained this month in the online edition of Proceedings of the National Academy of Sciences (PNAS), focused on changes to the inexpensive GST phase-change memory alloy that's composed of germanium, antimony and tellurium. "This phase-change memory is more stable than the material used in current flash drives. It works 100 times faster and is rewritable about 100,000 times," said the study's lead author, Ming Xu, a doctoral student at the Whiting School of Engineering at Johns Hopkins University. "Within about five years, it could also be used to replace hard drives in computers and give them more memory," he suggested. GST has been in use for two decades and today is widely used in rewritable optical media, including CD-RW and DVD-RW discs. IBM and others are already developing solid-state chip technology using phase-change memory, which IBM says can sustain up to 5 million write cycles. High-end NAND flash memory systems used today can sustain only about 100,000 write cycles. 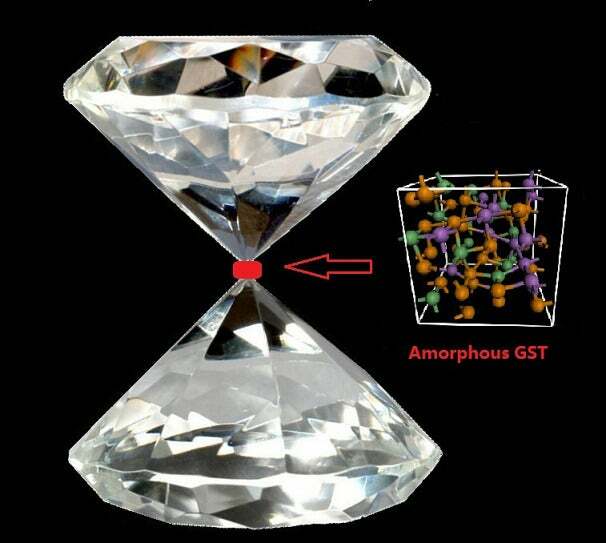 By using diamond-tipped tools to apply pressure to the GST, the researchers found they could change the properties of the alloy from an amorphous to a crystalline state and thus reduce the electrical resistivity by about four orders of magnitude. By slowing down the change from an amorphous state to a crystalline state, the scientists were also able to produce many varying states allowing more data to be stored on the alloy. GST is called a phase-change material because, when exposed to heat, an area of the alloy can change from an amorphous state, in which the atoms lack an ordered arrangement, to a crystalline state, in which the atoms are neatly lined up in a long-range order. The two states are then used to represent the computer digital language of ones and zeros. The two phases of GST, amorphous and crystalline, also reflect light differently, allowing the surface of a DVD to be read by tiny laser. While GST has been used for some time, the precise mechanics of its ability to switch from one state to another have remained something of a mystery because it happens in nanoseconds once the material is heated. To solve this mystery, Xu and his research team used the pressure from diamond tools to cause the change to occur more slowly. The team used a method known as X-ray diffraction, along with a computer simulation, to document what was happening to the material at the atomic level. By recording the changes in "slow motion," the researchers found that they could actually tune the electrical resistivity of the material during the time between its change from amorphous to crystalline form. "Instead of going from black to white, it's like finding shades or a shade of gray in between," said En Ma, a professor of materials science and engineering, and a co-author of the PNAS paper. "By having a wide range of resistance, you can have a lot more control. If you have multiple states, you can store a lot more data." This story, "Researchers Use Diamonds to Boost Computer Memory" was originally published by Computerworld.